TOSS - A FLIP DESTINY is presented by Knox Entertainment and is produced by Mukesh. D. Ramani. Written and Directed by Ramesh Khatkar. Music is composed by Sandesh Shandilya and Siddharth Suhas. Lyrics are an outcome of combined work of Kumaar, Sudhir Nema, Irshaad Kamil. Knox Entertainment's first film TOSS - A FLIP DESTINY is all set to release on 28th August 2009. 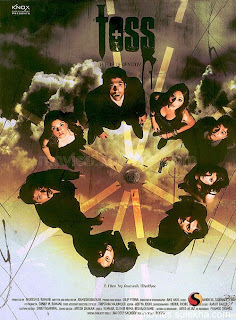 TOSS - A FLIP DESTINY is a murder mystery and stars MTV Roadies fame Rannvijay, Aarti Chhabria, Mahesh Manjrekar, Sushant Singh, Rajpal Yadav, Ashmit Patel, Master Hardik Sangani, South actress Madhureema Banerjee, Vijay Raaz (in a friendly appearance), Shruti Gera, Zakir Husaai, Rajendra settee and Prashant Raj (who played role of Amitabh in RGV KI AAG). TOSS - A FLIP DESTINY revolves around trust, relationships, love, money and individuals. An incident can change lives, beliefs, relationships and you. TOSS - A FLIP DESTINY is the captivating story of childhood friends who on their way back from a vacation stumble upon a fortune, two trunks full of hard cash along with a dead body buried in a ditch. They decide to split the money and start dreaming a king's life. They calculate the actions, risks, percentages- but forget to calculate the human heart. Soon before they realize the mistrust, intrigue, greed, deception, owners of the booty are after them, the law is after them and worse ...they are after each other. All the friends tread a path where greed rules and death has an equal chance of triumph.... death triumphs and relationship, bonding are buried deep inside tunnel holding no value. To safeguard themselves they do not hesitate to kill their friends...and money awaits its new set of victims! This hair-raising theme that revolves around an unpredictable human psyche keeps you on tenterhooks and its any one's guess who will survive the testing grounds...After all...It's a flip of destiny. Yash Raj Films' next release DIL BOLE HADIPPA, a romantic comedy set in Punjab, is a celebration of the never say die spirit of India. Here, for the first time, the dynamic duo of Shahid Kapoor & Rani Mukherjee, take you on a hide and seek game of romance, passion and dreams. 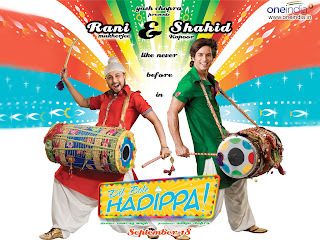 Directed by debutant director Anurag Singh and produced by Aditya Chopra DIL BOLE HADIPPA stars Shahid Kapoor, Rani Mukherjee, Anupam Kher along with Rakhi Sawant & Sherlyn Chopra, Dalip Tahil, Vallabh Vyas, Vrajesh Hirjee. 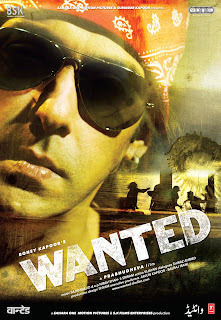 DIL BOLE HADIPPA releases worldwide on 18th September 2009. Veera (Rani Mukherjee) is a fire-cracker of a girl who lives in a small village but dreams in 70mm. She works in a local theatre group but dreams of playing cricket in the big league. Yes, believe it or not, she wants to play with Tendulkar and Dhoni for India. While Veera dreams on in India, Rohan (Shahid Kapoor) is an accomplished captain of a county cricket team in England. Rohan returns to India to captain his father's cricket team which has been losing consecutively for the last 8 years. In a village where girls don't play cricket, Veera has to put on a turban and beard and become a man to fulfill her dreams. Her brilliance on the field earns her a place in Rohan's team and Veera Kaur becomes Veer Pratap Singh. And then begins a roller-coaster journey of Veera, Rohan and Veer filled with music, romance and comedy through Punjab and beyond. This tale of turbans, twists and tricks will make your heart go - Hadippa! 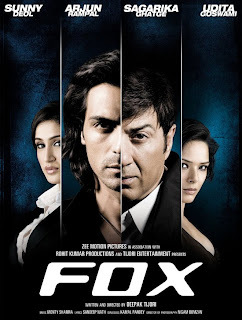 Zee Motion Pictures in association with Deepak Tijori production is ready to roll out with its first Hindi production, FOX written & directed by Deepak Tijori, starring Arjun Rampal, Sunny Deol, Sagarika Ghatge and Udita Goswami primarily. The music of the film is given by Monty Sharma and lyrics penned by Sandeep Nath. Film's choreography is done by renowned choreographer Raju Khan. FOX is a modern sleek thriller shot in the exotic locales of Goa and Mumbai. It is a story about a cat and mouse chase between a young successful criminal lawyer and a mysterious stranger who is controlling and threatening his life. Now the lawyer must seek the help of a reluctant cop in solving the mystery. A young boy’s suicide acts as a wake up call and sets a chain of events into motion. A group of eight boys and girls studying in the eleventh standard, playful, witty, yet rational are jolted when one of their friends Navneet (Priyesh Sagar) commits suicide because of his parents’ (Rati Agnihotri & Kanwaljeet). He is interested in taking up literature but his father wants him to be an engineer. All the friends are worried about the children who are committing suicide due to such reasons and decide to take a stand against this. With the help of a lawyer named Sanjay (Mithun Chakraborthy) they speak up against the parents and the government. This, of course, does not go down well with either the parents or the government. Anoop Soni represents the parents at court and the Government selects Nandita Prakash (Shilpa Shukla) as their lawyer. The Chief Justice of India, Justice Bharat Kumar (Mukesh Khanna), is appointed as the head of the bench. The whole nation supports the children in this movement. Now it's the law who has to decide. What happens next? Are the students right? What will be the judgment? Whom do you support? Fast Forward is the directorial debut of Zaigham Ali Sayed about four boys who are brilliant dancers but lack the opportunity to showcase their talent. Palaash (Vinod Khanna) gives them a helping hand. It’s not a smooth ride from here and the boys have to tackle some unexpected twists and turns along the way. Download latest songs from here.